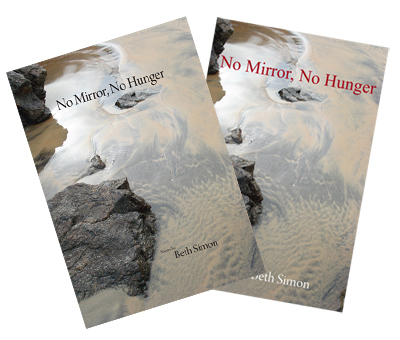 Beth Simon's first full-length poetry collection, Out of Nowhere, the Body's Shape, was published by Pecan Grove Press in 1996. Since then, more than 100 poems, stories, memoir, and collaborative pieces have appeared in a variety of places such as Epoch, Gettysburg Review, New Letters, Quarterly West and Southwest Review. She has a doctorate in Languages and Cultures of Asia, and is a professor of linguistics and creative writing at Indiana University Purdue University. 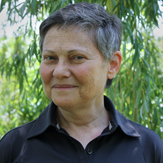 Her scholarly work focuses on language variation, especially in Tibetan, Hindi, and American English. Small Press Review "Pick" for April/May 2004.
my sweet, passion is a basin of misery lapped by the dog of links. the body gets dropped, not hypothermia or exsanguination. in peridot scales)—the fact is, you can't really swim in the ocean.